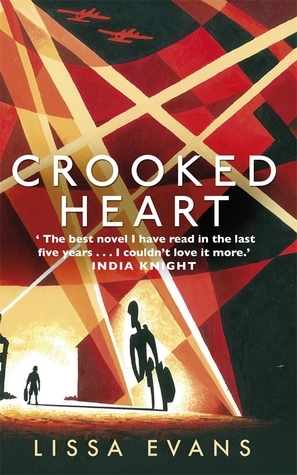 When I finished reading Crooked Heart by Lissa Evans, my first thought was that it reminded me of a cross between Cold Comfort Farm, I Capture The Castle and Goodnight Mr Tom. Those aren't comparisons I would ever make lightly - in fact, it's about as strong an endorsement you could get from me. As the Second World War breaks out, ten-year-old Noel Bostock lives in London with his adored godmother and guardian Mattie, an ex-suffragette with an entertainingly formidable personality and unconventional views on everything from world politics to education. But a tragic turn of events means that Noel - remarkably bright, painfully incapable of relating to children his own age and made conspicuous by protruding ears and a limp - finds himself foisted as an evacuee upon the sharp-tongued, duplicitous Vee Sedge, crammed into a tiny flat from which she, her selfish, silent mother and her equally selfish, lazy son Donald are in constant danger of eviction. It would have been easy to make this a straightforward 'plucky orphan wins over cold-hearted adult' story, but in fact, Noel is no Pollyanna. Noel is difficult, sullen and bitter and Vee is mercenary and unscrupulous - and that's where the strength of Lissa Evans' writing really comes into its own. There's a strong bittersweet flavour to this story of a flawed, emotionally bruised pair of misfits: it's moving, but never sentimental or sugary in tone. The fact that Evans can make us love these characters, despite their concerted efforts to make themselves unlovable, is absolutely key to Crooked Heart's success. There's also an undercurrent of tragedy to much of the novel's humour - the grimness of Vee's situation is, in particular, genuinely dark, and much of the comedy comes from the matter-of-fact manner in which appalling behaviour and events are recounted. But at the same time, there's a gentle, understated warmth to this book which make you want to hug it to your chest when you've finished. It's a lovely, life-affirming read with memorable characters, and the Second World War - all about making do, getting by, staying stoical and making the best things amid bewildering upheaval - is the perfect backdrop for the story that unfolds. At this point in a review, I'd usually be addressing any negatives, but I'm honestly finding it hard to think of any. This one's definitely going on my list of favourites. Great review! I remember Goodnight Mr Tom as the only book my son would read. He adored it! I've got this, and will be reading it shortly, thanks to this great review!